The average price in the Spanish electricity daily market in November 2018 was 61.97 €/MWh, 3.11 €/MWh lower than in October, continuing the decline of prices that began in October, after the publication of the Royal Decree-Law 15/2018, of October 5, with measures to reduce the electricity bill. However, the electricity price of this November is the highest of the last decade for a month of November. On the other hand, the Portuguese electricity market closed November with an average price of 62.01 €/MWh. 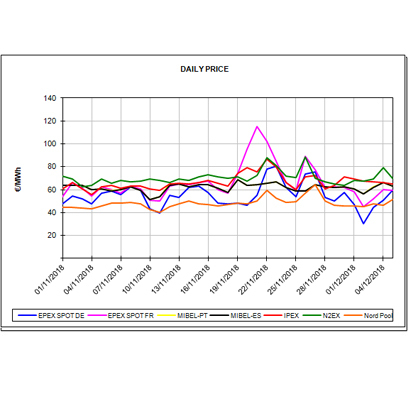 According to the data analysed by AleaSoft, in November, without taking into account the Nord Pool market of the Nordic countries, which was the electricity market with the lowest price in Europe, the average daily price of the MIBEL Spain and MIBEL Portugal markets was the lowest of the main European markets for six days: November 8, 9, 22, 23, 26 and 27. 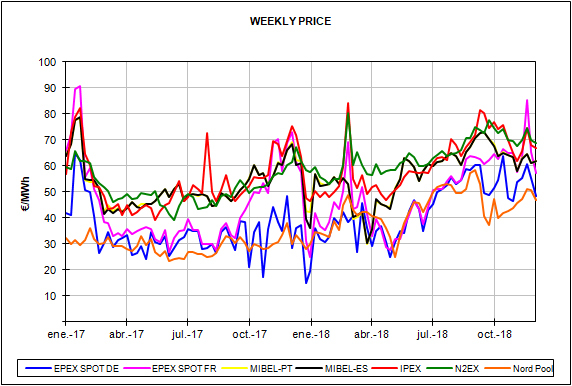 Looking at the monthly average, the MIBEL Spain market ranked as the third among the markets with the lowest price in Europe, behind Nord Pool and EPEX SPOT Germany. 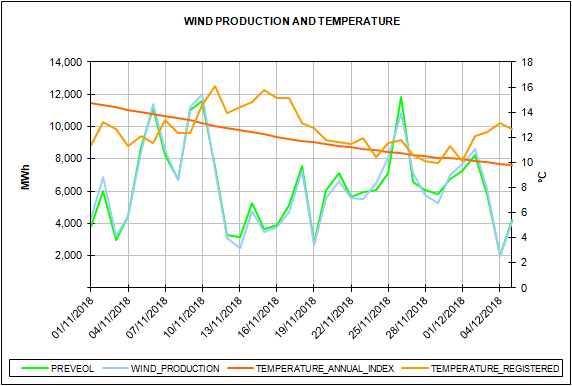 In November, the average price of the EPEX SPOT France electricity market, of 67.80 €/MWh, was higher than that of Spain, which allowed Spain to be positioned as net electricity exporter to France, something that did not happen since March of this year, in which also the price of France was higher than that of Spain. In November, the price of France has been affected by the conditions of the Belgian nuclear park, which has six of its seven reactors shut down. 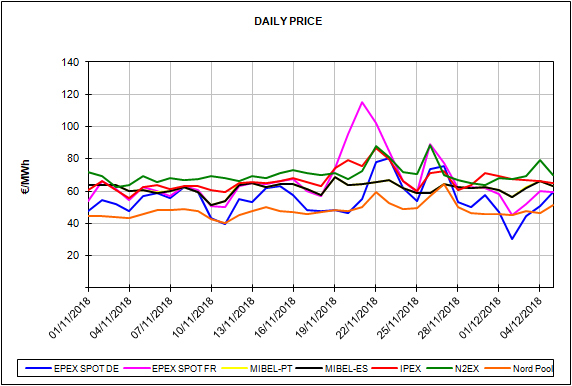 In the first five days of December, the EPEX SPOT Germany market price was the lowest of the main European markets, with an average price of 46.31 €/MWh, even below the Nord Pool market, with an average of 47.23 €/MWh. 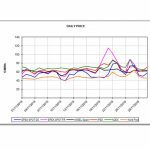 These Germany low prices were due to high wind energy production. The average price of Spain and Portugal between December 1 and 5 was 61.76 €/MWh and 61.97 €/MWh, respectively. 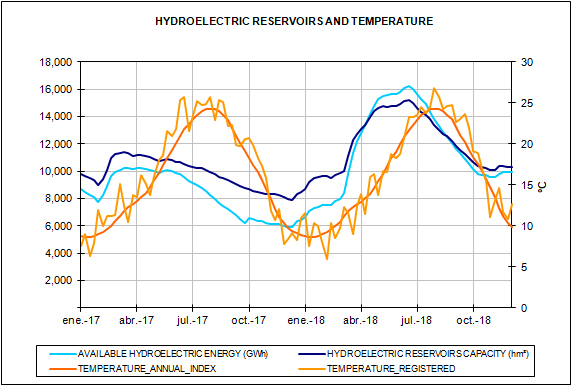 The Spanish electricity demand in November 2018 was 20,939 GWh, 0.2% higher than in November 2017, according to REE data. However, factoring in the influence of seasonal and working patterns, the demand fell by 0.8% in year-on-year terms. 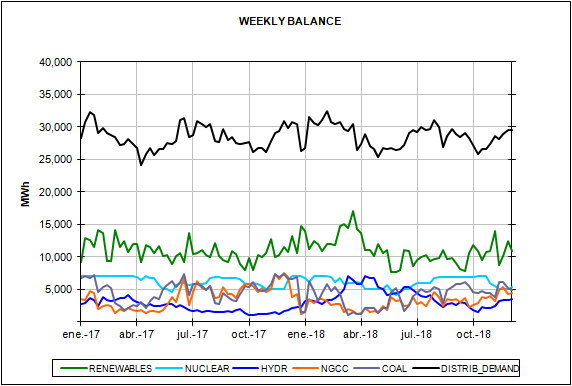 In November 2018, the wind power was the technology with the greater production in the Spanish electricity system, covering 21.6% of the production share in the generation mix, followed by coal, with 18.3% share, and by the nuclear, which with an 18.1% share, lost the first place, in which was ranked from July this year, due to the shutdown of Almaraz I and Ascó I during most of the month. The combined cycles occupied the fourth position with 15.2% share. During November, renewable production covered 35.4% of total production. The Brent oil price began November above 72 $/bbl and continued the bearish trend that had been experimenting since October to end the month below 60 $/bbl. However, from November 30, the trend has changed and it has begun to rise. 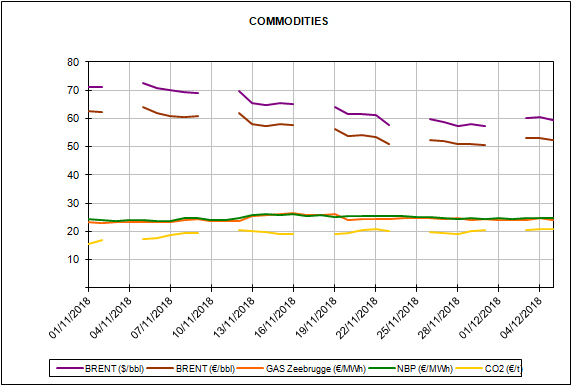 The futures of February 2019 were last quoted in ICE, on December 4, at 62.08 $/bbl. The API2 coal futures also maintained a bearish trend for most of November but in the last week the trend changed and they have started to rise. The price of February 2019 in the ICE futures market settled at 85.95 $/t on December 4, still far from the 93.25 $/t that was quoted in the session on November 1. 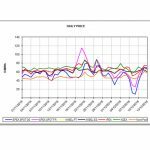 The TTF gas price in the ICE market was around 24 €/MWh and 25 €/MWh for most of November, except for the week of November 12 when it was above 26 €/MWh due to the cold snap that was expected in Europe in the week of November 19. In yesterday’s session, December 4, the future for February 2019 settled at 24.42 €/MWh. On the other hand, the price of CO2 emission rights, after the downward trajectory experienced in October, rose again during November. 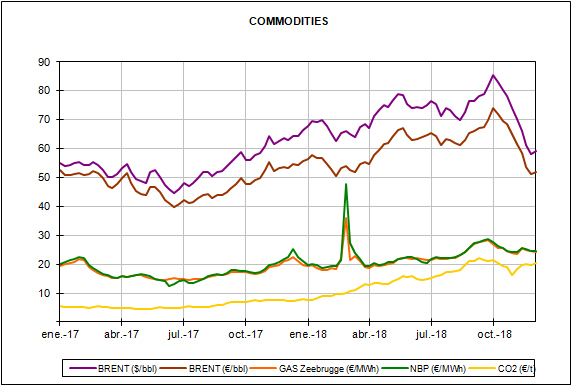 The price of December 2018 was 15.62 €/t on November 1 in the ICE futures market, and in the December 4 session it was already quoted above 20 €/t, at 20.73 €/t. The average temperature of mainland Spain has been above the usual values for this time of the year from the week of December 3 and in AleaSoft it is estimated that this trend will continue until the end of the week. 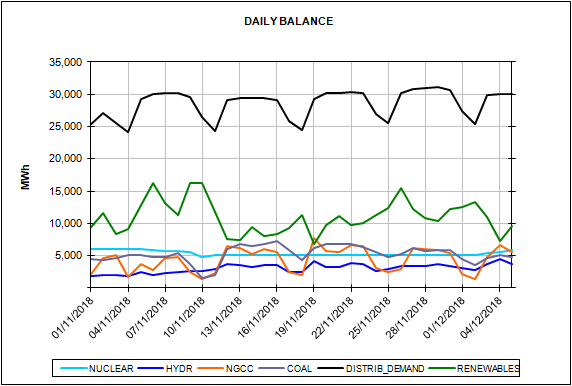 The electricity demand this week, after correcting the effect of the holidays of December 6 and 8, will be 2.2% lower than the previous week, of November 26, according to the AleaSoft forecasts.